At the onset of America's fight for independence, Thomas Jefferson - a delegate from Virginia in the Second Continental Congress - was asked to draft an official response to King George's policiesaffecting the colonies. Even though Jefferson was only 33 at the time, he already had a reputation as a skilled writer and a highly intelligent man with a burning passion for freedom. After consultinga drafting committee that included John Adams and Benjamin Franklin, Jefferson locked himself away and, over the next 17 days, he authored one of the most important documents in American history: theDeclaration of Independence. After the American Revolution, Jefferson served as the Governor of Virginia, a Representative in Congress, the U.S. Minister to France, and as Secretary of State under President Washington. In the Presidential election of 1796, Jefferson was narrowly defeated by John Adams but became Vice President based on election laws of the time. Thomas Jefferson was elected President in 1800 and became the 3rd President of the United States. One of the most significant achievements of his first administration was the Louisiana Purchase, which doubled the size of the nation. He then sent Lewis and Clark to explore the land which extended from the Mississippi River to the Rocky Mountains stretching from Mexico to Canada. After serving a second term as President, Thomas Jefferson retired to Monticello, the beautiful home he had designed in Virginia. Thomas Jefferson died on July 4, 1826 - the 50th Anniversary of the signing of the Declaration of Independence. Today, Jefferson is widely regarded as one of our nation's greatest Founding Fathers. He is honored on the nickel and is forever enshrined as one of the four Presidents on Mount Rushmore. 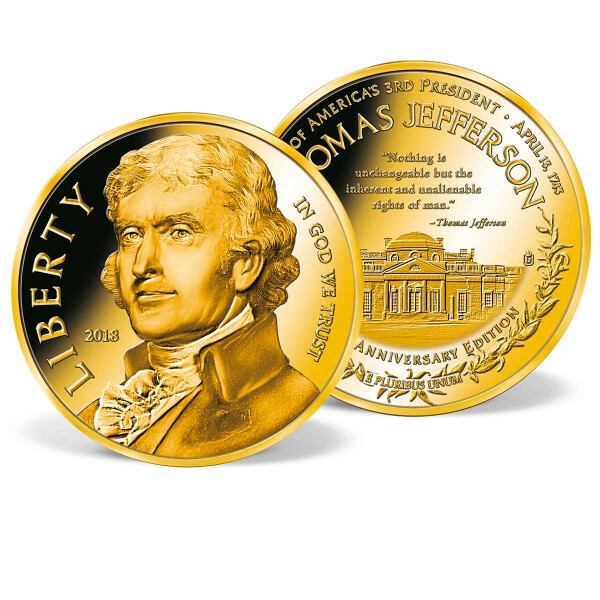 Available exclusively from American Mint, this limited-edition coin is specially minted to commemorate the 275th Anniversary of Thomas Jefferson's birth. Minted to the highest quality"Proof" standard, it is layered entirely in brilliant 24k gold. A brilliant example of the absolute finest in coin design and minting, it features a portrait of our nation's 3rd President on the obverse. The reverse is a stirring tribute to Jefferson with a highly detailed image of his beloved home, Monticello, under a famous quote from this Founding Father who wrote the Declaration of Independence. This special anniversary coin is strictly limited to only 9,999 complete collections worldwide and comes encased in its own protective capsule to preserve it for future generations.